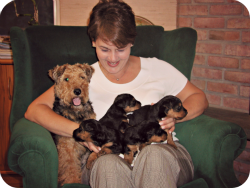 Welsh terrier Ava successfully delivered 3 puppies -one boy and two girls. Each puppy immediately began breathing upon removal from the birth sack. Things didn’t go as smoothly with puppy number 4. Despite using all the usual techniques to stimulate him, puppy number 4 would not breathe. We then used a fingernail to vigorously stimulate the acupuncture point known as GV 26. Stimulation was accomplished with a firm, deep, pecking motion. The puppy, later named Justin, gasped immediately and took his first breath. He continued to breathe normally and grew into a healthy, happy adult.